Thanks to all the supporters of my previous talks, I will be conducting more free public talks at Toa Payoh Public Library in 2013. Anyone can just walk into the room and listen to the talk at any point in time. So for those who are only interested for Part 3, you do not need to rush down at 7:00pm. I will reserve the most interesting Comet ISON presentation for the last part of part 3. Weather permitting, I may be conducting a free public stargazing session just outside the library. This stargazing event is conducted in my own capacity and not affiliated to NLB in any way. For those who can't attend this talk, no worries. Toa Payoh Public Library has kindly given me a regular 3rd Monday evening slot for each month for the talks. So at dates closer to these astronomical events in 2013, I can present the latest updated status of such events in greater detail. For example, talking about Comet panSTARRS in Feburary, Comet ISON in October, Saturn Opposition in April. Unexpected astronomical events can also be covered during such talks - .e.g. sudden solar outburst and activity. Looking forward to see you in these public talks in 2013! - Free. Open to Public. - No fix regular day in a month. - Mainly impromptu sessions subjected to schedule of forum members. - 2 of the most active sessions now are at open space outside Toa Payoh Public Library and in front of McDonald's at Bishan - Ang Mo Kio Park. 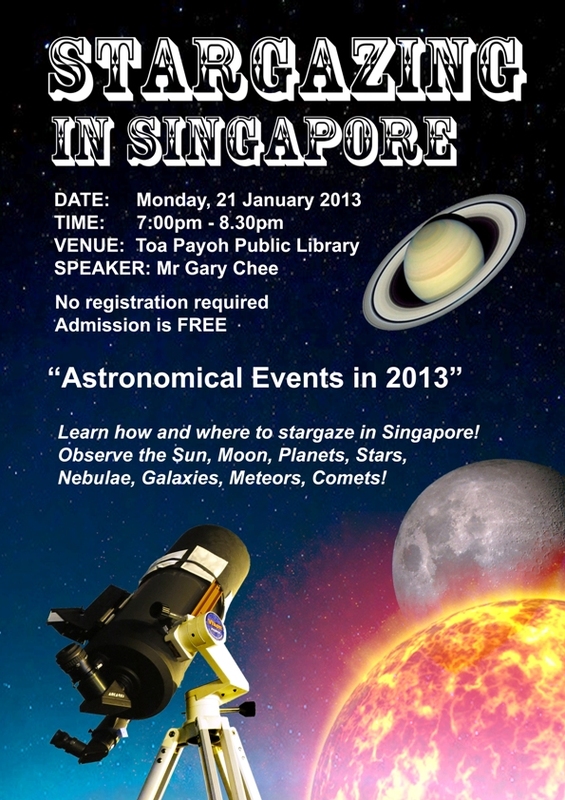 - Every Friday evening at Singapore Science Centre's Observatory. - $1 charge per visit. Please take note stargazing sessions are totally weather dependent. Such sessions can be cancelled very last minute due to bad weather. Please kindly contact the organisers for the latest updates if you intend to attend such sessions. Perhaps the most efficient way to get their updates online is via Twitter. So you may want to check their latest tweets on your phone even when you are on your way to the event venue. (1) Do NOT touch any part of the telescope setup. Parents please kindly remind your children about this when it is their turn to observe through the telescope and if need be, physically ensure your children are not touching it. (2) Do NOT take flash photography inside the dark observatory domes. This will temporary "blind" everyone inside and prevent them from enjoying a better view with their dark-adapted eyes. A brightly lit handphone screen can have such a "blinding" effect too. So dim down your phones screens or better still, refrain from using it in such dark rooms. (3) NO SMOKING around the telescopes. Even if the stargazing event is conducted in a place where smoking is not prohibited, participants should be considerate and refrain from smoking near the telescopes. The second-hand smoke is not only harmful to human health but may also damage the coating of the telescopic optics. - Standing in front of the telescope and asking the telescope operator a lot of questions. - Trying to take a photo with your camera or phone through the telescope eyepiece. Unless the queue is really short or the crowd is really small AND the telescope owner gives you permission or encourage you to do so upon your request. When in doubt, please ask. (5) Do NOT demand the telescope to be re-positioned to view different objects. Especially for large observatories with long queues, you will most probably get to see only one object which is deemed best to be observed by the telescope operator. There may be other smaller telescopes deployed around the event area. You may request to look at different objects through them subjected to the approval of those telescope operators. If everyone can observe the above-mentioned and exercise basic kindness, then everyone can get to enjoy the views in a fair and efficient manner.